When Cillian Jackson needed a power wheelchair, the members of the Farmington High School Robotics team volunteered & got to work. Ask any parent of a disabled child: adaptive equipment like wheelchairs makes all the difference in the world to quality of life. It’s also enormously expensive. Your grandpa’s electric scooter won’t cut it, and a power wheelchair can easily cost over $20,000, which insurance often won’t cover. 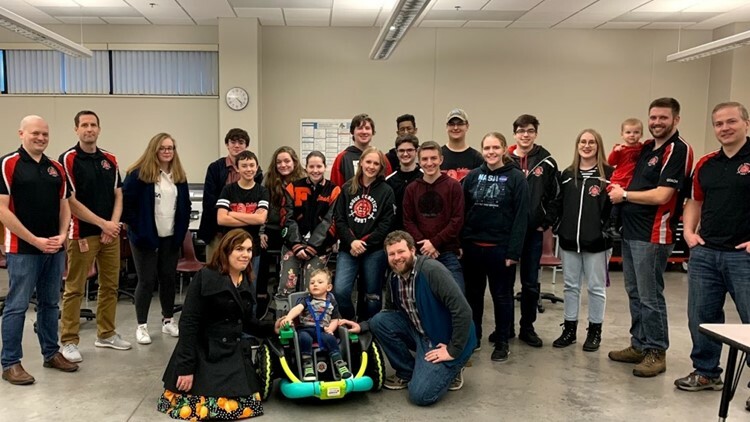 So, Tyler Jackson reached out to the robotics team at his high school alma mater — Minnesota’s Farmington High School — and asked if they could build a power chair for his two-year-old disabled son, Cillian. No problem. The award-winning Rogue Robotics team took a $300 Fisher-Price electric Power Wheels toy and essentially yanked out the insides, replacing it with upgraded components to turn it into Cillian’s customized power wheelchair, at a fraction of the cost of a conventional model. Result: Cillian, whose disability makes mobility a real problem, can now get around just fine — and look cool doing it.